Fran's trip through Virginia did not dump nearly as much water on Madison County as the Great Flood of 1995, and did not cause such widespread catastrophic damage. Severe rainstorms in mountainous areas are localized events, deluging some places while leaving others nearby almost untouched. Fran affected the upper Rapidan much more intensely than the Great Flood. Miles upriver, Shenandoah National Park's Big Meadows center and much of Skyline Drive remained closed for several weeks until damage was repaired and electric power was restored. On Rapidan Camps' property, cabin 3 appears to have suffered the only substantial damage. An aggressive limb broke from a healthy tree during the torrential winds and crashed into the porch, punching a small hole in the deck and obliterating approximately 3 square feet of the cabin's eaves. That limb and other storm debris distributed about camp were cleared within a few days by various volunteers, including Tony Allen, Bonni Braswell, and Chris and Diane Merrill. 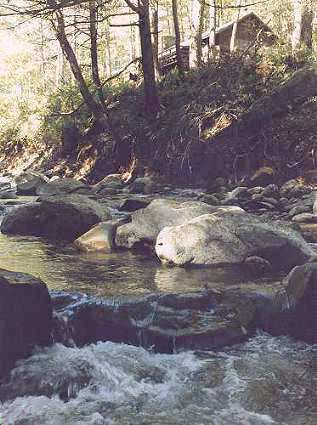 This photo shows the river below Cabin 3 several weeks after the flooding. You can see the river's high-water mark nearly halfway up the bank; almost all the vegetation below this line was scoured off the bank as the river raged past. The adelgid blight that has killed most of the hemlocks in the area helped to reduce the flood's damage, as the death of the trees eliminated the canopy that used to prevent sunlight reaching the riverbank. The thick covering of plants that grew on the upper bank resisted the floodwaters. Almost nothing remained of the former bridges; the approaches to the lower bridge are shown here; the dark area in the center is the gap between the piers above and below. The foundation remained intact, and this bridge was rebuilt the next month, partly because it is the only way to access the Fork Mountain federal antenna installation. 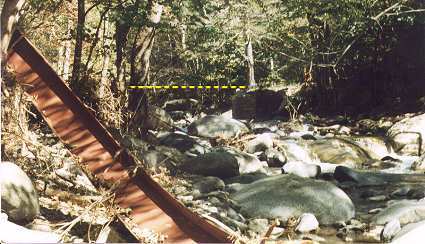 The steel I-beams that used to form the bridges' backbones were scattered down the riverbanks; this photo shows one twisted beam washed downriver from the lower bridge. The yellow line in the background shows where the bridge surface had been. Much more damage was sustained at the site of the upper bridge. (The yellow line shows the old bridge surface.) A higher foundation was built for the replacement. The upper bridge used to have a pylon at mid-river supporting the iron beams; Jen Williams stands beside the worn remains of that stone support. 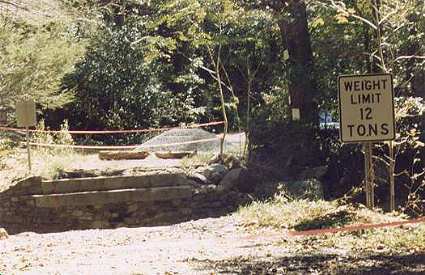 Until the bridges were rebuilt, access to camp involved driving across the riverbed. The rough ford is just behind the long limb at the right center of the photo. During dry periods when the river was low, it was navigable with care by passenger cars. When the waters were higher, the road sometimes became impassable even by large 4-wheel drives. Until the upper bridge was rebuilt in Spring 1998, quite a few drivers overestimated their skills and severely damaged their cars and trucks when they got stuck in the river crossing. All photos at the Rapidan Website are copyrighted by Tom Jones, and may not be used any further than routine WorldWide Web browsing without permission (although those who ask usually receive it).